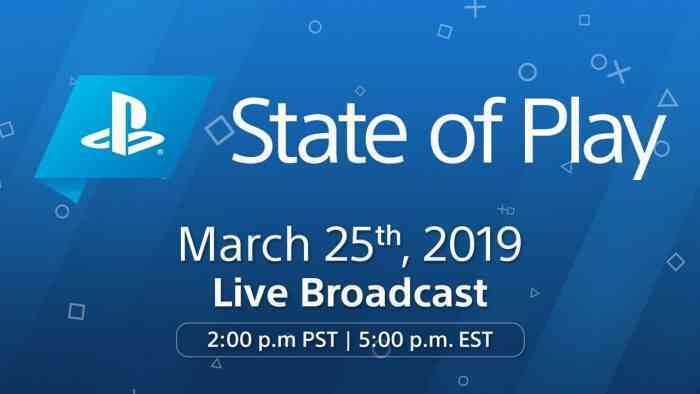 Sony has announced State of Play, a new video series that will reveal new updates and announcements on PS4 and PSVR games. Sounds a bit like a Nintendo Direct, doesn’t it? The first episode will launch on Monday, March 25th. Announced via the PlayStation blog, the episode will be broadcast at 2:00 pm PT on Monday. Elsewhere in the world, that’s 5:00 pm Eastern Time, 9:00 pm in the UK, and 7:00 am on Tuesday for anyone on Australia East Coast. Details are pretty scarce right now but the blog does indicate that State of Play “will give you updates and announcements from the world of PlayStation.” Monday’s stream will “showcase upcoming PS4 and PS VR software, including new trailers, new game announcements and new gameplay footage.” There is no information as to how long the stream will be. Since Sony has opted out of E3 2019, this is probably a smart idea for them to generate some buzz early on and even after. You can tune in to the stream via Twitch, YouTube, Twitter, or Facebook. In case you can’t watch it live, Sony will have the VOD edition up shortly after the episode airs. State of Play will also return throughout the year with even more updates and announcements. Will you be tuning in? Share your thoughts in the comments section down below.